March 23, 2015 I felt a lump during my breast self-exam. I called my doctor the next day. At the mammogram the technician said they were going to do an ultrasound. A Radiologist told me they’d schedule a biopsy and not to come back alone. My favorite doctor called me on April 13th, 2015. I was at the top of the stairs when he said, “I have bad news, Tara. You have cancer. Don’t worry; I have the best doctors and surgeons for you.” I had to sit down. I was in shock. I ate healthy, I worked out, I drank water, didn’t smoke, rarely drank alcohol. Cancer doesn’t discriminate and it isn’t fair. Invasive Ductal Carcinoma, Stage 2A. I chose a double mastectomy/immediate reconstruction. Cancer was in my breast, lymph nodes and mammary gland. 168 days of chemotherapy began that July. Radiation began in January 2016, 30 treatments, Monday – Friday for 6 weeks. #TEAMTARA helped me FIGHT. Every single day folks would call, text or reach out through social media. They were praying for me, thinking about me, carrying the load. 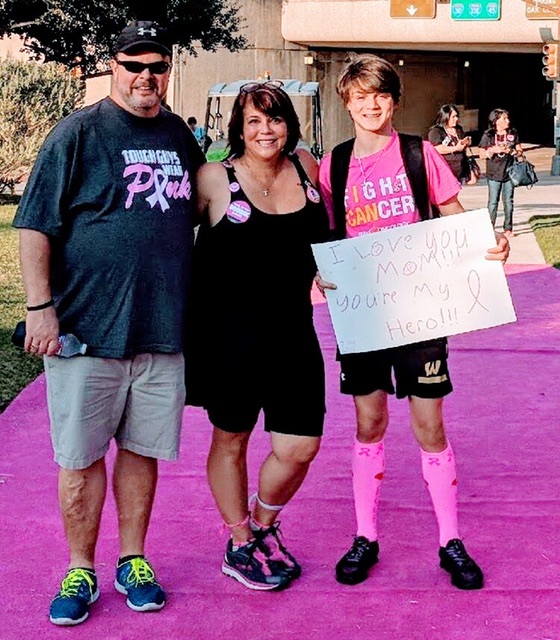 I have always been an advocate for breast cancer, raised nearly $20,000 with Susan G. Komen walking 60 miles every November. I reach out to Survivors and care givers often to pay the love forward. In my darkest hours, there was always someone there for me shining a light, offering HOPE. Never ever quit. No one fights alone. God is bigger than cancer. I am forever grateful to my husband, daughter, son, family and friends for seeing me through my battle. No one talks about the aftermath of cancer. I pray every Survivor has a support system for that as well. Survivorship is hard.